Keyanna Green and Courtney Gunsaulies participate in Ag Olympics during lunch on March 15. Ashlyn Dunn, Rachael DuLaney, Hailey Combs and Shelby Stoops wear their official FFA dress to school on March 15 to represent the chapter. These Urbana FFA members participated in the Meals of Hope event. 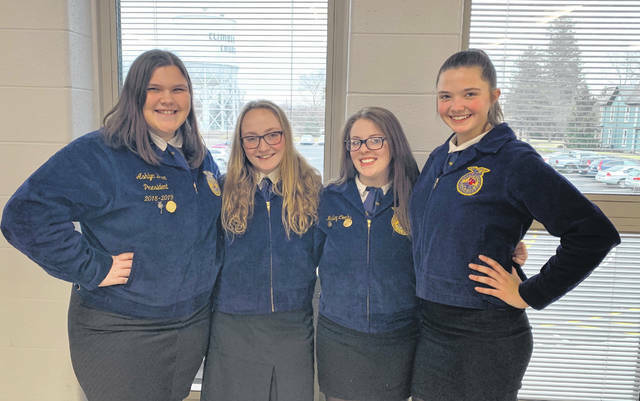 From March 11 to 15, the Urbana FFA held FFA Week to honor the chapter’s 74th anniversary, National Ag week and the FFA. Every day during the week, chapter members participated in activities and dressed up for themes to celebrate and advocate for agriculture. On Monday, March 11, FFA members and advisors prepared soup and sandwiches for the Urbana High School staff and members dressed like their favorite teachers. These activities helped to show the FFA members’ appreciation for their teachers. It was also Advocate for Agriculture Day, so students were asked to make ‘Ag Positive’ posts on their social media in order to share a good message about the organization. 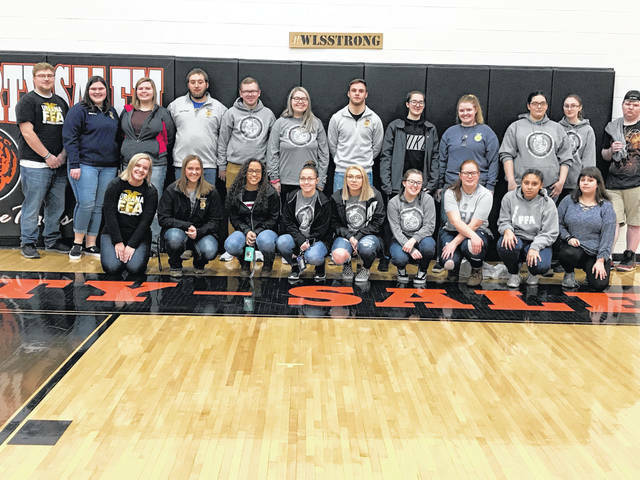 On Wednesday, March 13, 21 Urbana FFA members traveled to West Liberty-Salem High School for Meals of Hope. At this event, over 50,000 fortified pasta & tomato sauce meals were made which will all stay in Champaign County. On Thursday, March 14, the chapter had an FFA emblem scavenger hunt. UHS students had to find the hidden FFA Emblems around the school to be entered for a chance to win a prize. There were 115 emblems hidden around the school, 1 for each FFA member in our program. Students also dressed in “county” or “country club” attire to show not all FFA Members are farmers. 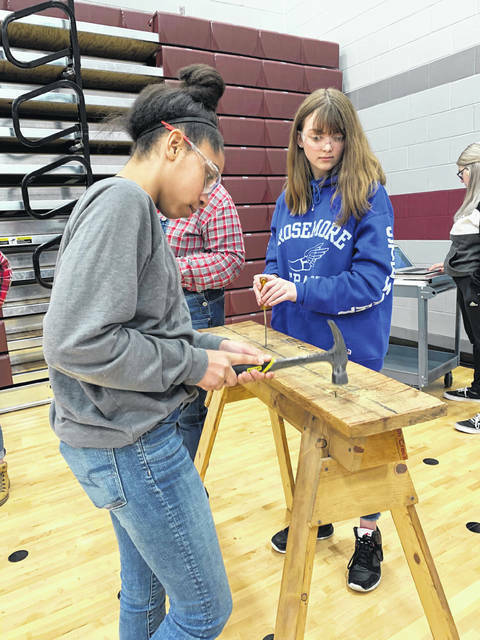 During lunch, UHS students had the opportunity to participate in the “Ag Olympics.” The Ag Olympics is a relay race that consists of nailing in a nail, screwing in a screw, carrying an egg on a spoon, a sack race, and chugging a cup of milk. The March chapter meeting and FFA elections were also this day. The officer slate for next year, which was voted on at this meeting, is as follows: Justin Preece, President, McKinley Preece, Vice President, Peyton Tener, Secretary, Janie Wallace, Treasurer, Rachael DuLaney, Reporter, Conor Thomas, Sentinel, and Jessica Salyers, Student Advisor. On Friday, March 15, students wore their FFA gear to school to show their pride in the chapter. If members wore their FFA attire, they were awarded with pizza from Sparky’s during lunch. The 2019 Urbana FFA Week was a success, and the chapter is excited to see what the 75th anniversary has in store!